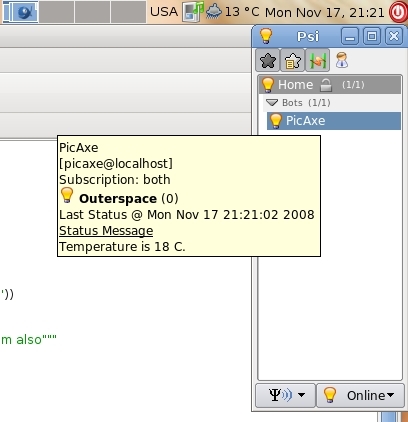 Stelios's Place - Jabber (XMPP) + PicAxe = Even More Fun! Home > Projects > Jabber (XMPP) + PicAxe = Even More Fun! Note, that you will need to create a seperate account for the PicAxe to use and send updates with. You might want to use the server at www.jabber.org. Remember that you also need to add the PicAxe Jabber user as a 'Buddy' in order to be able to track data updates. The data can either be displayed, silently, as a user's status or sent as an alert through as a chat message. 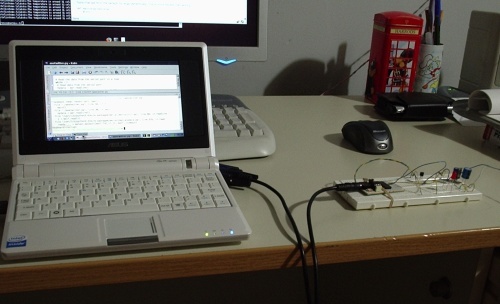 ASUS eeePC 701 and PicAxe! On the image below you can see the Python script logged on the Jabber network. The PicAxe user status is updated and displays the temperature in my room. 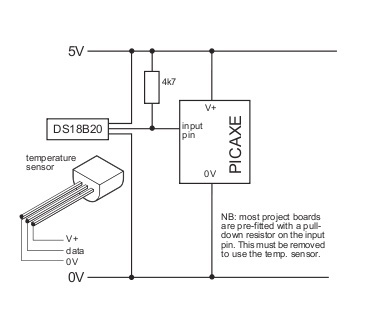 The circuit is based on the circuit provided in the manual (page 60) for interfacing the PicAxe to a DS18B20 temperature sensor. You are going to need the download circuit and a serial cable for the RS232 communication between the PC and the uC. I have also an LED on pin 1 which turns on whenever the PicAxe sends data to the PC. The PicAxe circuit is based on the circuit in the manual.